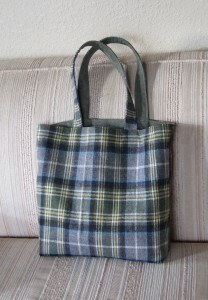 I made this gigantic tote for my mother-in-law for her birthday. She, of all people, really appreciates and uses totes. I knew a big one, shown here holding two standard bed pillows, would be just right for her. 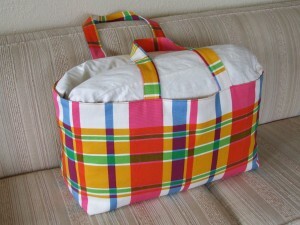 I loved the fabric when I saw it at a thrift store: a bright, sturdy, fabulous plaid in perfect condition. It was likely the leftover from some past upholstering project, which I really wish I could have seen. I walked away telling myself, “You don’t need any more fabric.” which is quite true. But as the days passed, I thought of it sitting there at the store. Who but me would love it and take it home and give it new purpose? I suppose it’s a good thing my weakness is fabric instead of, say, stray cats. The tote is lined with a mustard-yellow polyester and I know she will get a lot of use out of it. 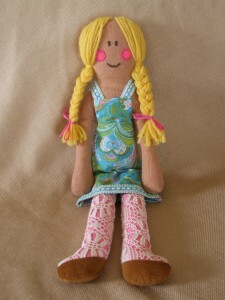 It was a lot of fun making Ruby this doll for Christmas. I had been wanting to make her one, so, feeling like I may just be able to squeeze it in before Christmas, I started on the evening of the 23rd and was able to finish her late that night. This is her second dress I made recently. I like the first one but it was done very quickly at the last minute, and I wanted to make one that I could relax and enjoy making and I am glad I did. It was so fun. Ruby tells me she’s named her Flower, which is quite appropriate, don’t you think? Here is Ruby playing with Flower but the photo I really wish I had is of them napping on Christmas day, their sweet little faces side by side. I came across some linen hand towels I had collected. 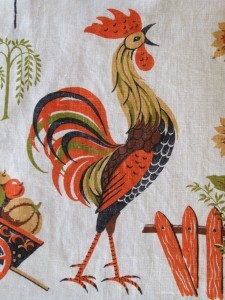 I had forgotten about them and was inspired by this Rooster one, such a great design. 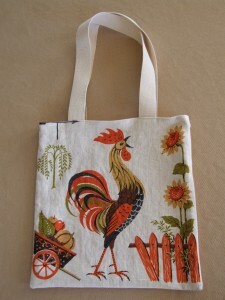 I decided it would make a nice tote bag for Owen, since he is quite fond of chickens, and, well, a rooster is close enough. Since my nephew moved closer to my Mom, they have been traveling back and forth more often to see each other, mostly my Mom traveling by train from San Diego to Orange County and back. 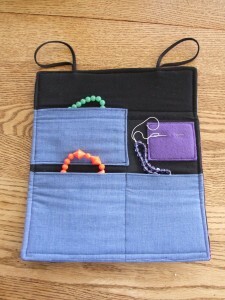 Since beading is my Mom’s craft of choice, I made her a traveling case for her bead projects so she can bring her projects with her on her visits to Orange County. I made it with this lovely African textile sent to me by a high school friend I’d reconnected with, Leslie. She sent me the greatest package filled with fun fabrics, some African ones from her travels and some fun vintage ones, which she’s always had an eye for. Thank you, Leslie! For my Nephew, I made him a tote bag of his own for carrying books, art supplies, etc. when he travels. Over a year ago, my sister-in-law asked me to help her with a project; she wanted my nephew’s baby blankets made into a quilt. 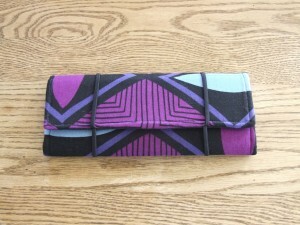 Here’s the catch: like most modern baby blankets, they are made of soft, stretchy knit fabric. Think t-shirt fabric, the fabric we wear most, a comfortable fabric to be sure, but a fabric most undisciplined when it comes to quilting. So, instead of a quick project slicing and sewing together blocks of fabric, each piece was going to have to be stabilized somehow in order to get the blocks to go together in the least distorted way possible. My Mom was coming up for a visit in early December and I talked her into making the quilt together, “It can be a gift from both of us” I offered. Hey, she’s a veteran quilter, she knew what she was getting into. 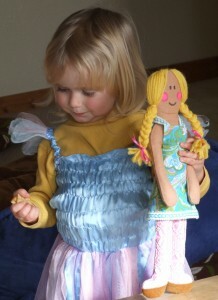 I guess the promise of a Mother/Daughter crafting collaboration was to good to pass up. Interfacing is the process of using an extra hidden layer to your fabric to achieve a quality that is not inherent in your chosen fabric (often to add stiffness, strength, bulk or stability). Fabric stores sell interfacing for all purposes, both iron-on and not. Internet sources recommend iron-on interfacing when quilting with knits, which makes sense as it would be stable fabric joined to the knit fabric through the magic of adhesive. I am not a big fan of iron-on interfacing, but have been thankful for it for certain applications. Mostly, I interface the old-fashioned way: using leftover, god-awful upholstery fabric to add stiffness to my project behind-the-scenes. My Mom and I worried, with our blocks being large in size, that even the process of ironing on the interfacing would give a result that was distorted. We decided to interface the old-fashioned way: using an old sheet. 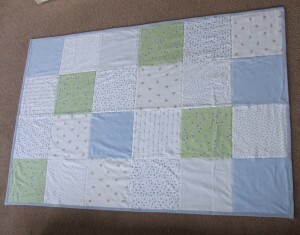 We cut the sheet into blocks of the size we wanted and painstakingly pinned those to our rough-cut baby-blanket squares, and trimmed the knit block to the size of sheet block after it was pinned together. Keeping the fabrics pinned together, we then pinned the blocks to each other, face-to-face, so that each seam sewed on the machine would be a sandwich of unruly fabric between obedient fabric. There was a lot of pinning and some unladylike remarks, but finally, in this way, we successfully assembled the quilt top. Boy, were we proud of ourselves. We had no time to rest on our laurels, we had to get this quilt finished, my Mom was leaving in two days! After some discussion, we agreed no middle layer, and a flannel sheet for the back, and My Mom has a clever way of leaving enough overhang of the back fabric to fold it over and use it for the binding as well. Love it. We painstakingly pinned top to back along the seam lines. The quilting plan was to “stitch the ditch”, following the seams of our block grid, figuring that our block seams were the stablest part of our top. Working together, rolling and unrolling, me at the machine, my mom guiding the bulk, we quilted away. Following the seams, I used a narrow zig-zag stitch to catch both sides of the joined blocks, and the result was better than I’d expected: no puckering or pulling of the knit, smooth sailing. Next, we trimmed up our edges, folded the flannel over the edges to make a nice binding, pinned it and stitched it into reality. We had been preparing for a less-than-perfect quilt, but it really came out quite reasonable and nice. We were so pleased with our work, so glad we tackled the project together, and so relieved to be done! So, there’s the long-winded tale of a true gift. 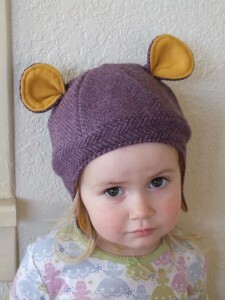 Here are a couple more ear hats ordered by a friend for some little ones in her life. 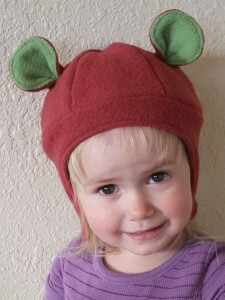 100% recycled and post-consumer, wool outside, fleece lined. I made these for two good friends with holiday-time birthdays (I know, shouldn’t those be outlawed? Cool it in March, people.) 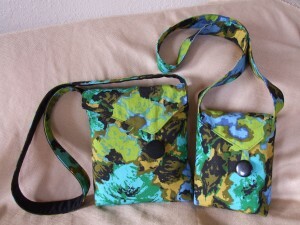 I knew they both were in need of new Marinamaroo purses, since it had been 2 years since I gave them purses that had been put into daily use. Now I’m forgetting who, of course, but someone used the phrase “urban camo” to describe the print. Someone will remind me. I am so excited! Now that the gift-giving is done, I can finally post my holiday projects! 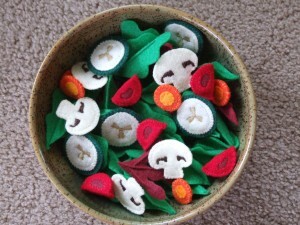 I’m starting with some fun felt food for some youngsters in my life. 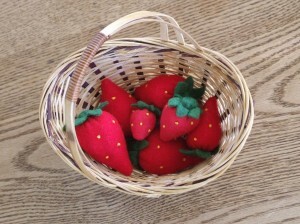 A basket of strawberries for Ruby. After watching me make some for two of her friends she asked, “Momma, can you make some strawberries for me?” Ok. 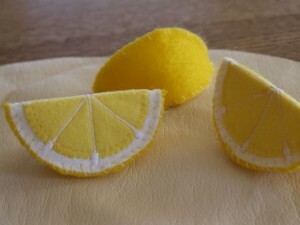 Lemon slices and Crepes for my boy, Owen, who would eat them for breakfast, lunch and dinner if he could. The crepes I cut out of this faux-leather vinyl-type stuff and they have the weight and floppiness and feel of real crepes. 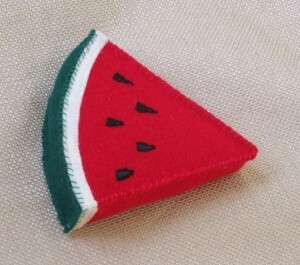 And last but not least, a slice of watermelon for a girl who loves it. Every now and then, there comes along a fabric so adorable, I can hardly stand it. 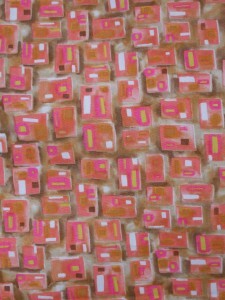 My Mom found me less than 1/5 of a yard of this pink geometric print in a second-hand scrap bag. 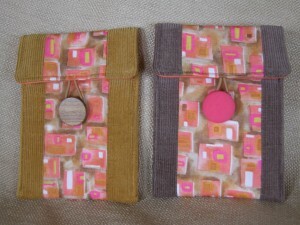 I made these pockets to feature it and I hope my friend doesn’t mind I gave her one as a gift partially to secure visitation rights. I happen to have a lot of adorable fabrics, but something about this one just makes me swoon. 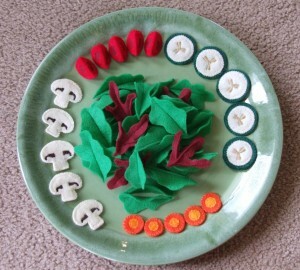 This is a felt salad I made for a dear little girl who turned 4 last week, complete with cucumbers, mushrooms, carrots and tomatoes. I included a salad bowl, salad spoons, and this adorable mini salad spinner I had found at a yard sale when Owen was little.